I’ve heard lots of excuses about why people don’t play board games, they’re too expensive, they’ve got long manuals with complex rules, friends who are so competitive you just can’t play board games with them. 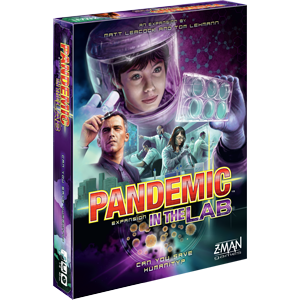 Pandemic is a co-operative board game so no one’s going to get too competitive, and it has you working at the Centre for Disease Control, flying around the world trying to cure four doomsday plagues before they skim humankind from the surface of the earth, so it’s not even nerdy. It’s captivating, pacey and dramatic. 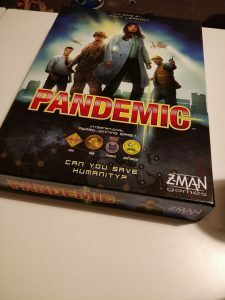 Add to that the fact that the manual’s few pages are crystal clear, which makes setting up and playing the game simple from your very first play, and this makes Pandemic the perfect board game with which to start your collection. Anyone who’s played Plague Inc will know the perverse thrill of watching diseases creep across the planet, pinching out cities you’ve never heard of. In Pandemic, this is handled by tiny, delicious looking cubes which remind me of cubes of jelly and an Infection deck of cards. On their turn, in addition to trying to save the world, players will draw at least two of these cards, each naming a city. You’ll place a coloured disease cube in these cities (to signify the disease spreading), unless there are already three cubes there, at which point the levees break and you place a cube in every connected city, which, of course, might cause another outbreak and suddenly you and your friends are in hot, bacteria-infested water. 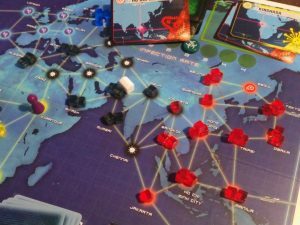 In other words, like most co-op board games, Pandemic keeps the pressure up by making sure every step anyone takes, the problem lurches forward, too. Did I mention there were not one, but four diseases you’ll have to beat to win? Each in a different continent? 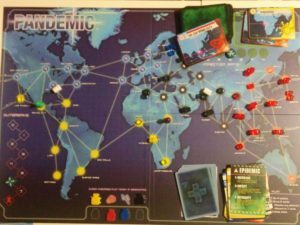 The puzzle that drives Pandemic (and keeps players talking) is the question, every turn, of whether it’s more important to work towards prevention or the cure. The excellent answer you’ll reach is that, to survive, you’re going to have to do both at once, all the time, which means a lot of teamwork and a lot of plotting. This plotting is something everyone can get involved in, because Pandemic really is very simple. On each of your turns, you can take four actions, and an action can be as simple as moving between two connected cities or scrubbing one disease cube from the board. Where things get tricky is that everyone holds a hand of Player cards, each with a city and a colour of disease on. You’ll be drawing two of these every turn. By discarding one you can “Take a direct flight” and zip straight to that city on the card as an action. But if you find yourself in the city presented on the card, its power is immense. You can “Charter a flight”, going anywhere on the board – but both of these actions mean sacrificing the card so it can no longer be used. You can throw up a new Research Centre that players can travel between, for free, expanding your friends’ private transport network. Or you can give that card to another player stood in the same city. Why would you be in the same city? Shouldn’t every player be curing a different, far-flung corner of the globe, Ah, see, the way you finally cure diseases is by collecting five cards of the same colour, then cashing them in at a Research Station, at which point a Cure action in a city removes not one cube, but all of them. This also opens up the dangerously seductive option of all the players dropping everything to wipe that disease out entirely, making the game exactly 25% easier. More importantly, when you’ve discovered the cure for all four diseases, you win – without having to eradicate them too (something we didn’t realise at first and we continued playing for over an hour after winning). 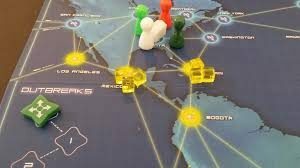 All of which means making a move in Pandemic first involves deciphering your way through any number of problems and possibilities. Osaka needs attention now, but you’re holding the Osaka card as part of the red disease set you’re collecting, so a flight’s out of the question. You could waste most of your turn catching a ferry to Madrid then driving to Paris, but you could do so much more work by staying here, in Buenos Aires. 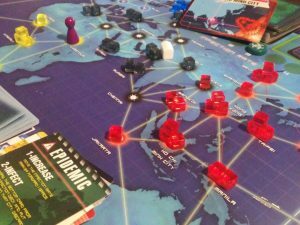 “What are the odds that Osaka will get infected again, anyway?” Regarding the odds of places getting infected again, we come to the single rule in Pandemic that, is just so clever, the Intensify Phase, which even sounds awesome. 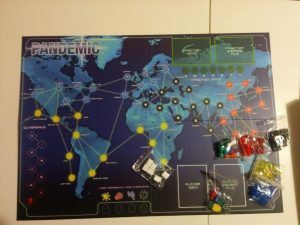 Hidden in Pandemic’s player deck are a number of “Epidemic” cards. Rather than getting your bonus at the end of the turn, the lot of you might be blindsided by three cubes placed in a single city. Which is bad. But what’s really bad is that this triggers the Intensify Phase, where you pick up the cards you’ve drawn so far out of the Infection deck, shuffle them, and place them back on top of the Infection deck. This means disease cubes in Pandemic don’t simply get sprinkled across the board like plastic hailstones. 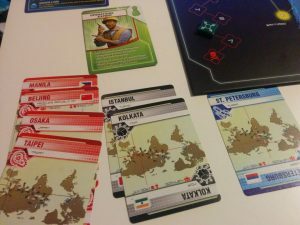 If your game starts with a ripple of Red infections in Tokyo, Bangkok and Shanghai, those cities are going to get hammered again and again for the entire game. This gives every game of Pandemic a different flavour, but it also brings in an element of card counting. Was Paris in the discard pile before that last Epidemic? How sure are you guys? Because, suddenly, the entire game is hanging on whether or not you can let Paris be. It is important to note at this point that at any time you can look through the discard pile to see which cities could get reinfected, and in turn cause an outbreak. 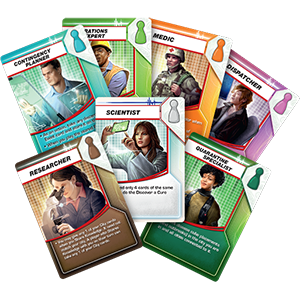 At the start of the game, every player draws a role at random: Researcher, Scientist, Healing Medic, Dispatcher, Contingency Planner, Operations Expert, and Quarantine Specialist. Each of these cards gives a player a special move or role in the gameplay, from being automatically able to remove all cubes from a city as one action to being able to move other players pawns. Pandemic is just a really good puzzle. It’s not a particularly deep one, so very sensible tactics (if not solutions) rise to the surface after just a few plays, but what Pandemic lacks in difficulty it makes up for in accessibility. Absolutely anybody can play this game, and as a nice bonus, we had as much fun with two players as we did three, meaning it’s the perfect game for couples or friends alike. Just think! You. Your loved one(s). A case of beer and a simulated apocalypse. Bliss. On the Brink expansion: This adds a fifth disease, or the option to make one of the diseases an unpredictable virulent strain. It includes new roles for the players, new diseases, and even a Bio-Terrorist variant with one player against everybody else. In the Lab expansion: This gives a new way to discover cures by collecting samples of diseases from around the board. After carrying out various actions in a custom lab you can cure diseases. 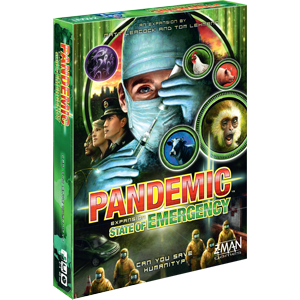 This expansion pack also allows a single-player mode of Pandemic as well as a version where you have two competing teams. New role cards and event cards are also included and it can be combined with the On The Brink expansion pack too. State of Emergency expansion: This pack adds five new roles as well as new locations on two new boards and three new challenges. Hinterlands Challenge sees diseases jumping from animals to humans and you have to investigate the source before they spread. The Superbug Challenge adds a fifth disease that cannot be treated – forcing players to work together to create doses of vaccine. Finally, the Emergency Event challenge adds extra nasty event cards into the deck. 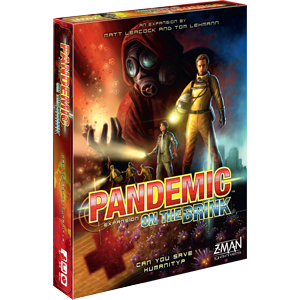 The pack also allows players to adjust the difficulty level by adding quarantine markers that reduce the spread of diseases. This entry was posted in Board Games, Me.